STAR TREK AT 50: Five Favourites From Five Series | Warped Factor - Words in the Key of Geek. To celebrate Star Trek's 50th anniversary we're looking back at a variety of fan favourite episodes every Wednesday throughout 2016, all chosen by one of our team or by a guest contributor. Today we have five in-house choices from five of our team, spanning all five (to date) Star Trek series'. Assignment: Earth was intended to be a pilot episode for a new series produced by Gene Roddenberry about a time traveler named Gary Seven who has traveled from a far more advanced world to secretly help mankind. 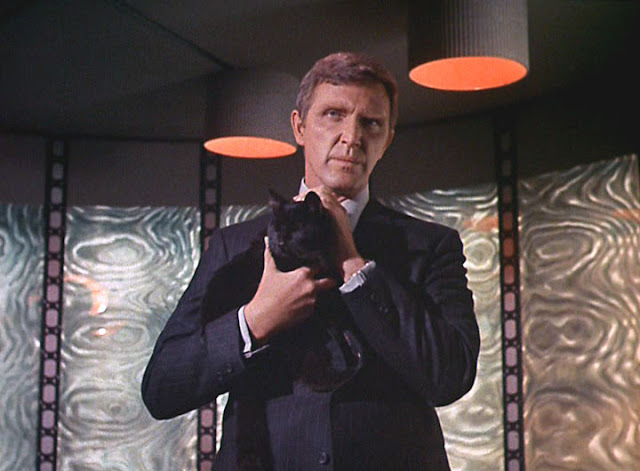 With it looking as if Star Trek was going to be cancelled Roddenberry reworked his pilot story into the last Trek episode of season 2, however Trek got picked up for one more year and NBC passed on the Gary Seven series. Robert Lansing stars as Gary Seven, although he goes uncredited in the titles, oddly. He portrays the character rather cold and somewhat rigid but it works. Story wise, Gary Seven accidentally lands on the Enterprise, they are shocked to see him and think he's up to no good as the Enterprise was actually meant to go back to the 20th century to do some unobserved data collection for historical reasons and there is no conceivable reason why they should intercept a space traveler all the way back then. How all this is resolved is a delight. As for my reasons behind picking this episode, well there are many. The acting is very good and the humour is well infused within the story so the exposition is not so heavy-handed. It's also a very interesting concept, an entertaining one that I always feel wistful about what could've been when rewatching it. The basic premise of the time loop is nothing new for the science fiction genre, but the subtle changes that are present in every loop make this episode a joy to watch again and again as you slowly start to notice them all. It's not just that the loops are all shot at slightly different angles, bur things like when Dr Crusher is attending her plants and is humming a musical phrase, this subtly changes in each subsequent loop. 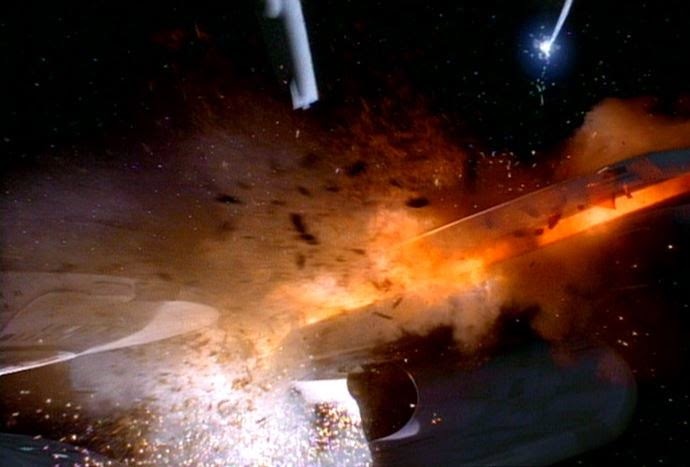 Cause and Effect just grabs you from the very beginning, and even though on first viewing when you see the Enterprise explode you know it will all be OK by the end, you just don't know how they are going to get there. The joy of that repetitive journey makes for some superb science fiction. 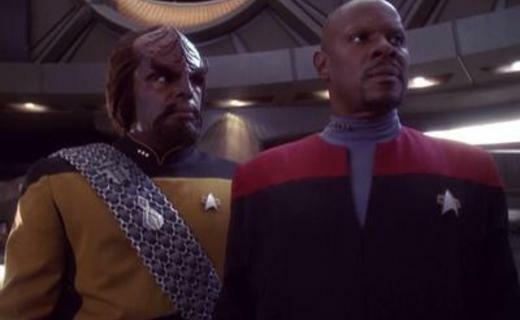 Deep Space Nine didn't need to bring in Worf as a main character, it was already proving to be, arguably, the most successful Star Trek series in regard to storytelling and cast, but the addition of Michael Dorn propelled it to further greatness, making it my favourite of all the Trek series. The Way of the Warrior, the first episode of season four, involves a proactive strike by the Klingons against the Dominion by attacking Cardassia, much to the irritation of the Federation. Answering the question, how do you deal with Klingons? They wisely picked the ultimate Klingon for the job. Lt. Commander Worf. There's also a return for another favourite of mine, Andrew Robinson, who, as always, gets to scene-steal as the sardonic and crafty Garek, and as well as the usual superb acting from the regular and guest cast members, this episode has some stunning special effects. Especially the scene when the armada of Klingon ships de-cloak, revealing that they are surrounding the space station. This a landmark episode in the seven-year history of the show. I never really enjoyed Voyager that much, not like DS9 or TNG or TOS. There were some high points to the series but I found them to be few and far between and so it's not a show I've gone out of my way to rewatch completely from start to finish (something I've done with the other Star Treks). However on first viewing I stuck with it to the end and I'm glad I did as the finale is one of the very best. Endgame opens with a celebration to mark the tenth anniversary of Voyager's return to Earth after its twenty three year long journey back from the Delta Quadrant. 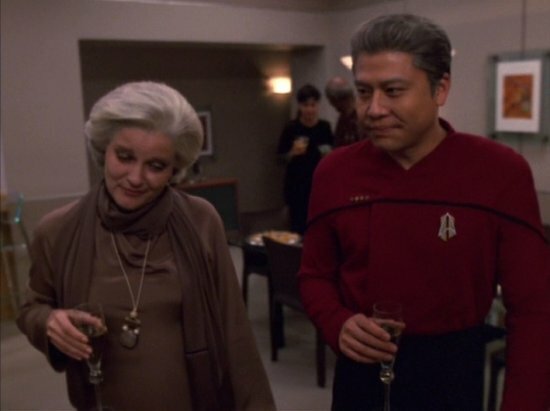 There are noticeable absences though and we soon learn that Seven of Nine died in the Delta Quadrant, Chakotay made it back but was never the same after Seven's death and died on Earth and Tuvok has had an emotional breakdown due to an illness which could have been treated in the Alpha Quadrant but not in the Delta Quadrant. Janeway, now an admiral is working on acquiring a device that will enable her to return to the Delta Quadrant at a time when they are close to a Borg transwarp hub which could get them home in minutes. Once back the admiral still has to persuade her younger self that it is possible for them to go up against the Borg and get home, she must also convince herself to use the hub rather than destroying it. Ultimately the two of them come up with an idea which may serve both of these goals although it would call for an act of self sacrifice from the admiral. Kate Mulgrew really did a fine job in the duel roles of Captain and Admiral Janeway, and it was great to see Alice Krige make a welcome return as the Borg Queen, the scenes between her and Janeway were great. I'm pleased that they picked a suitably iconic villain for the final episode, it made this one I'll happily rewatch time and time again. After finally arriving back on Earth the crew of the Enterprise receive an official heroes welcome, however once the pleasantries are over things don't go so well, when Dr Phlox accompanies Malcolm and Travis to a bar he finds himself being abused for being an alien, Captain Archer finds himself in front of an enquiry over an incedent which took place some time before and when T'Pol returns to Vulcan with Trip she learns that her mother has lost her job due to T'Pol's involvement in exposing a Vulcan spying system hidden in a Vulcan sanctuary. 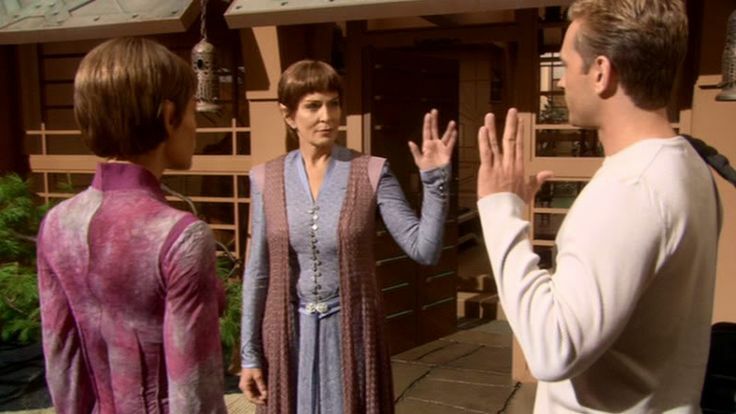 Season four's Home is very much like The Next Generation episode Family, in that it's a small story where very little major happens, just some crew having shore leave. But just like that classic episode, it's one that gives the cast a chance to really shine, it's a good character driven episode, and is one of the stand out installments of Enterprise for me. Which is your favourite Star Trek episode (from any series)? If you'd like to share your love for a particular story, and would like to write about your favourite (either a paragraph or two, or a full blown 500-1500 word article) then please contact us at warpedfactor@live.com and put Trek@50 in the subject bar. We'd love to hear from you.